Ninety-Seventy years ago a tragic event happened which would lead to the loss of life and serious injury to the people of the town. In August 1915 Goole suffered an aerial attack by a Zeppelin air ship of the German Armed Forces. In a series of three posts the Society will tell the storey of the raid and process of remembering the war dead. The first actions of enemy conduct on Britain were throughout late 1914 with Sea Bombardments to Great Yarmouth and the East Coast. In January 1915 the Kaiser approved aerial bombardments by Zeppelin airships. The first aerial raids targeted Norfolk and London. In June 1915 the first air raid on Hull took place causing loss of life and damage to property. The short summer nights saw little enemy action over the next several months but in August 1915 the raids re-commenced with consequences for the town of Goole. On the 9th August five Zeppelins were launched against Britain. Four of these were targeted against London and the fifth, L-9, was aimed to target Hull. En route to Hull L-9 was attacked by aeroplane and losing orientation flew in direction of Goole. 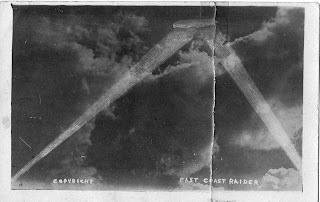 An official account states that the Zeppelin first made land over the East Coast, at Skipsea, during the night of the 9th August but upon being intercepted by aircraft made out to sea and became lost in fog. Twice the Zeppelin returned over land before being followed out to sea by aeroplanes. An hour later the Zeppelin again flew over land in the vicinity of Hutton-Cranswick and Beverley before reaching the River Humber, at 11.10pm. The airship navigated westwards along river before reaching Goole. The town not previously subject to air raid precautions was showing lights and unprepared for an air raid. At 11.15 the town was bombed. The censorships of the period meant that the Goole Times, published three days after the raid, reported the attack under the title an ‘East Coast Raid’. The account reports that another air raid had taken place on the East Coast by an air ship sent by the ‘vile and unscrupulous Huns’. It is reported that little damage was done to property but lists one man, nine women and six children killed and five men, seven women and several children receiving ‘more or less’ serious injuries. In reference to damage it is stated that incendiary bombs caused some fires but these were quickly extinguished. The night of the attack was extremely dark, with thick fog, which rendered night flying very difficult and one of the pilots sent to engage the enemy was killed in a crash landing. The Admiralty [the Navy being responsible aerial defence at the time] reported that a squadron of hostile airships visited the East Coast on the night of the attacks causing fires by dropping incendiary bombs but these were quickly extinguished and only immaterial damage was done. One Zeppelin was seriously damaged by the gunfire of the land defences and was reported on Wednesday being towed into Ostend. It was later subject to continued attacks by aircraft from Dunkirk under heavy fire and it is now reported that, after having had her back broken and rear compartments damaged, she was completely destroyed by explosions. The report of the air raid does not reference the name of the town attacked and downplays the extent of damage caused to the town, despite being reported in a local newspaper and the true extent of the raid already well known. The politics of war therefore prevented newspapers providing information to help the enemy or damage the moral of the civilian population. An account of the raid will feature in our next blog. Hook, J (1995) This Dear Land: The Zeppelin Raids on Hull and District 1915-1918. J. Hook.